Ross is one of my most fun and oldest friends from my Uni days...and despite our distance (he lives in New York) we remain good friends albeit via social media and the odd overseas package. I wasn't able to make it to Ross and his now husband Cesar's uber hip wedding in New York almost 2 years ago now, so I wanted to make something special to commemorate their wonderful day. Something that they could hang in their cosy brownstone apartment in Brooklyn. It gave me a chance to indulge in my most favourite pastime of hand drawn lettering and to come up with something personal and unique. I could have just made them a normal print on paper but I wanted to amp up the special on this one. So, I got it printed at Onstone, a great local business who print on a stone compsite surface and use upcycled materials to frame the printed surface. Creating a one of a kind piece with its own character and charm. There were lots of things I knew I wouldn't have time for after Logan was born and I was ok with that. 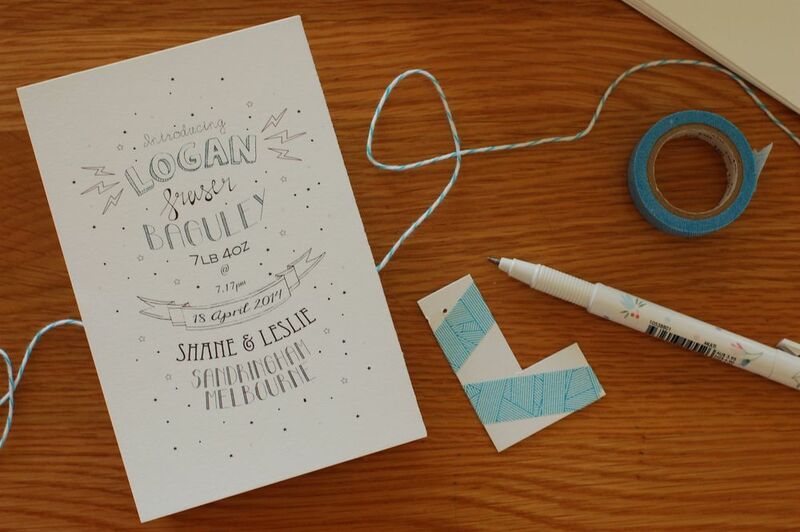 However, I had one thing that I wanted to do and that was to design and make Logan's birth announcement/thank you card. Making my own cards is my thing, i do it every year for Christmas and for Birthdays and other occasions when I can. So, this was not negotiable. This was a once in a lifetime thing and I wanted them to be special. So amongst the haze of the first couple of months I sat down with my sketchbook and tried to come up with a cute idea to commemorate and celebrate Logan's first few months with us. My general lack of energy and lack of sleep did nothing to help my imagination and I nearly went down the pre-designed print off the internet route. Alas, my imagination kicked in and I came up with this little design. Super happy with the result, I felt like the old me was still in there and I could fit in some creative projects when I put my mind to it. A mixture of hand drawn lettering and computer wizardry I came up with Logan's 'stats' for the front. 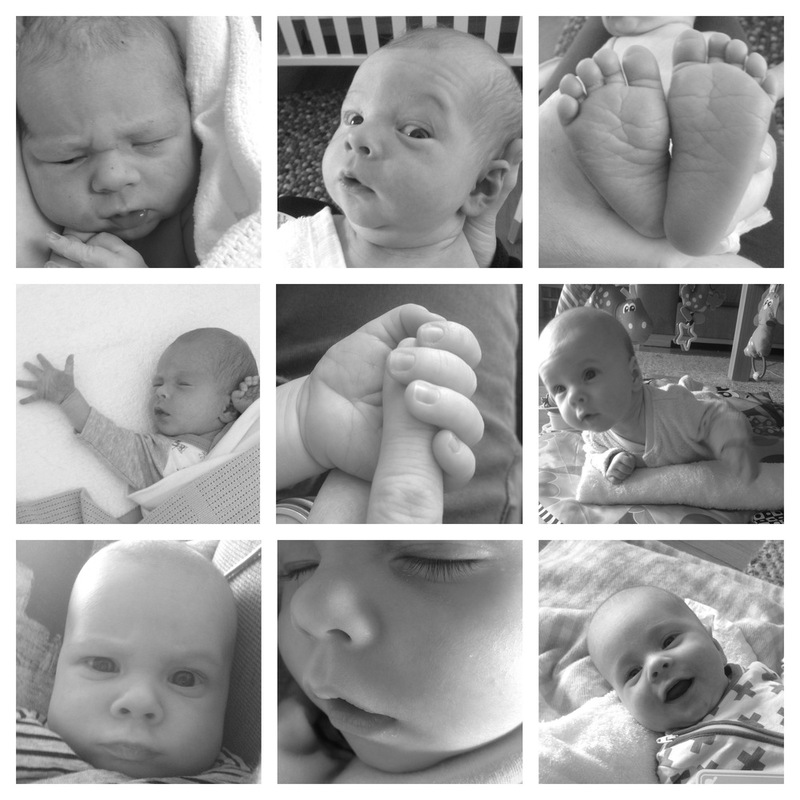 The accordion style card allowed me to add a little summary page of Logan's cutest moments from the first three months (yeah it took me that long). 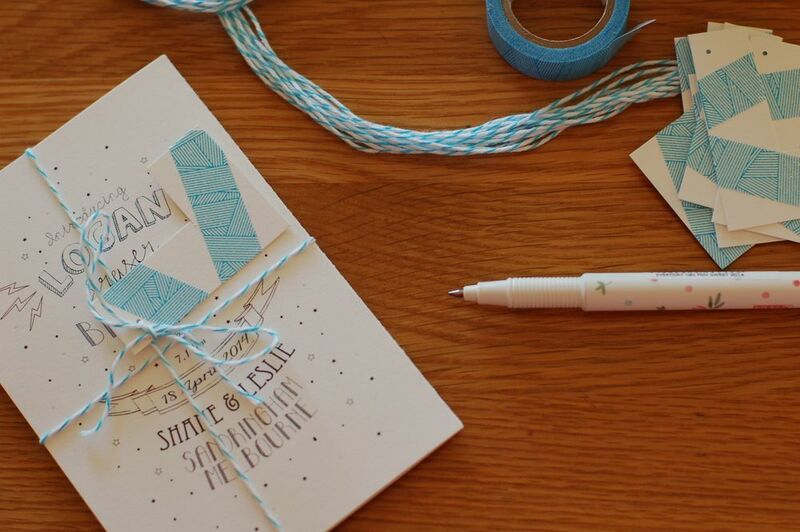 The addition of a twine bow parcel style bow and washi tape decorated letter L tag, made it look like a little gift. It has taken so long to write about these its almost time for me to come up with some first birthday invites...! So exciting! 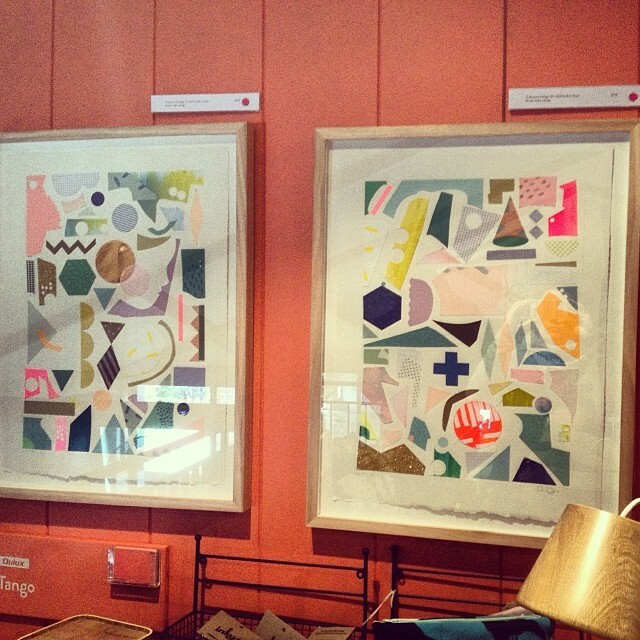 The Design Files Open House was back again this weekend in Melbourne and I was excited! I dodged the gloomy Sunday weather to seek out the not so secret location in the backstreets of leafy Hawthorn. The colourfully decorated Mini peeking from the garage was just a taster of what was in store inside. Kirra Jamison customised Mini tucked away from the Melbourne rain. For the third year Lucy and her team at The Design Files have pulled together what can only be described as a truly inspired and unique event. Like the previous two open houses a unique home was selected as a backdrop for a carefully selected selection of some of Melbourne and Australia's best design and art pieces. With one big difference its not just to look at, everything was for sale. This year colour was a big feature of the house with Dulux one of the major sponsors, alongside Mini, Jardan and Country Road. Each area of the home was accented by a bold colour wall which really made a feature of some of the hottest artwork around at the moment. 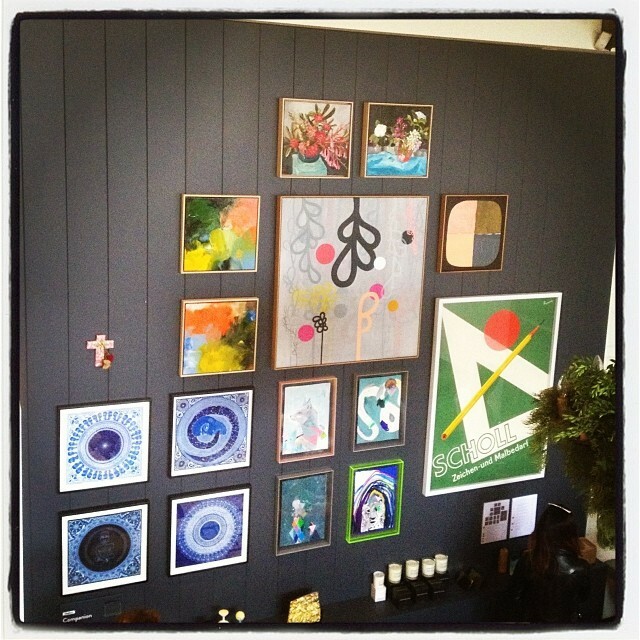 Including pieces from some of my favourites Kirra Jamison, Rachel Castle, Lucas Grogan and Miranda Skoczek amoungst many others. Sadly, my pockets were not quite deep enough for what was hanging on the walls! Never fear there were still plenty of more affordable items on show including dependably fabulous textiles and homewares from Melbourne favourites Bonnie and Neil, a new range of accessories from Homework, new project from Lara Davies and Jess Wright of Harvest Textiles fame! A couple of new discoveries for me were the small desk accessories and objects from Studiokyss and the delicate glass work from Amanda Dziedzic. I could quite easily ramble a lot more about all the wonderful things on show, but well why bother when you can go check them out on the Supplier page on the official Open House website. 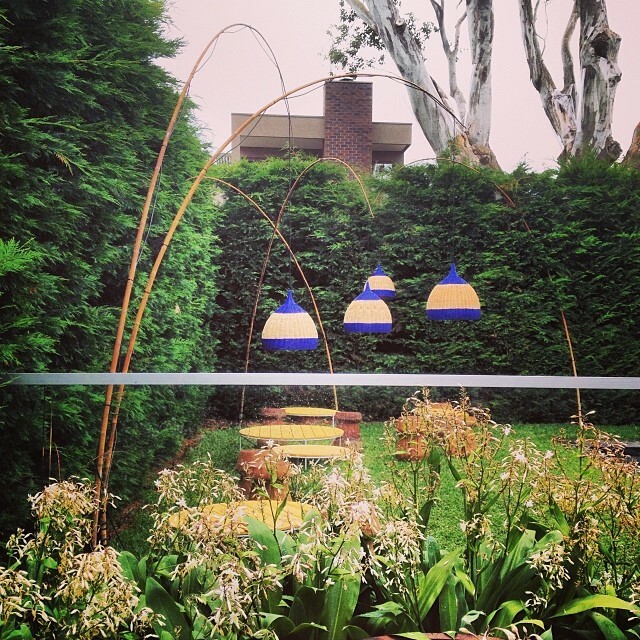 Wonderful lights in the garden bobbing around on bamboo supports just like flowers in the breeze. Sadly I only managed to snap a few shots with my trusty iphone for instagram as it was so busy but check out the professional shots from the house at The Design Files. I remember when I was young getting a calligraphy set for Christmas, I am not sure what came of that set but needless to say I did not become a master calligrapher that year. 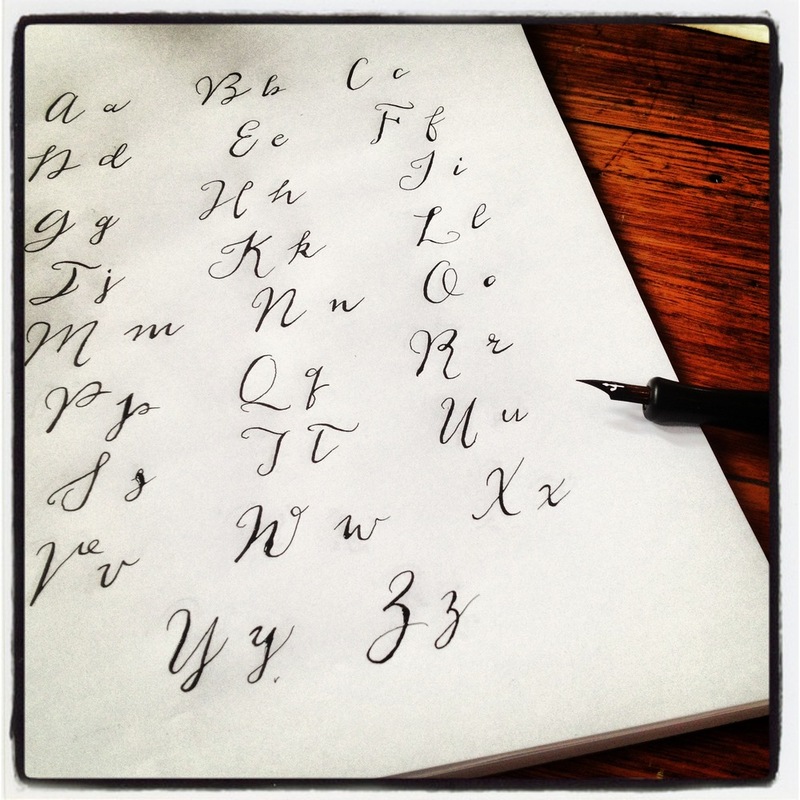 Roll on 25+ years and the desire to learn calligraphy was still very much with me. 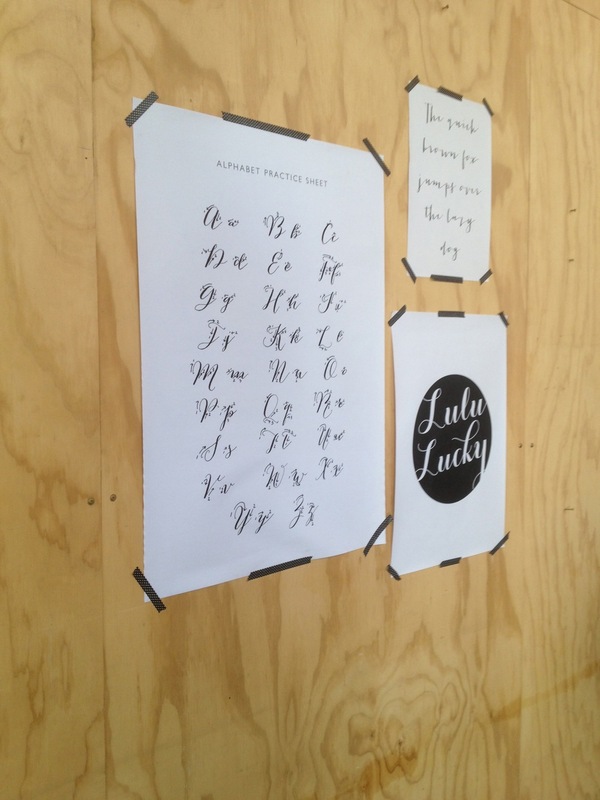 To say I was excited when scrolling through Instagram and a post from the wonderful Blog Society announcing modern calligraphy classes with Lulu Lucky popped up in my feed!! I was all over it and signed up straight away despite the fact it was up in Sydney. A week or so later a follow up post announcing another class, this time in Melbourne had me in a fluster emailing Jaclyn founder of Blog Society asking if I could switch. A little reorganising and I got into the Melbourne class thankfully. 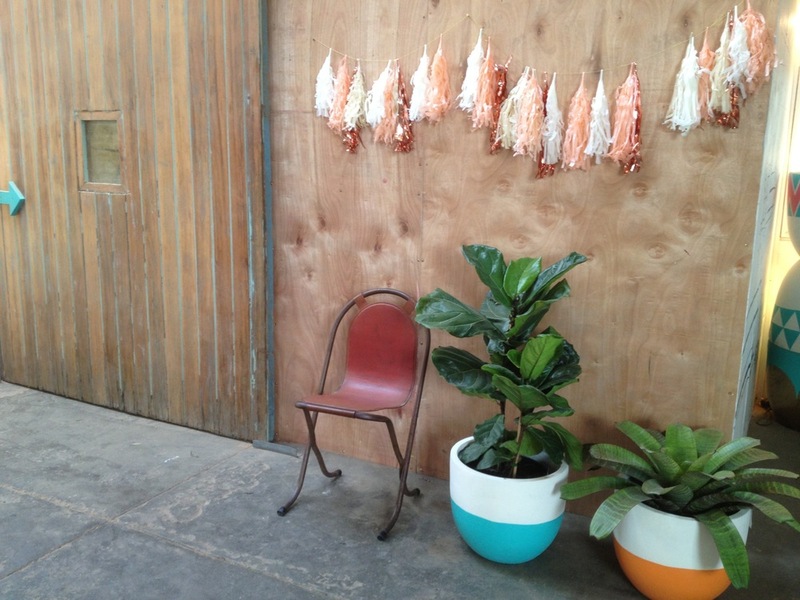 Roll on to two weeks ago and I made my way to the Pop and Scott workshop space in Northcote, Melbourne. Just walking into the studio, I knew it was going to be a good day. With Melbourne weather turning on its charm, the ladies had the fire stoked and our workspace decorated beautifully with fresh flowers and lovely finishing touches. Such a great contrast to the raw workspace we were in. Sitting down at the heavy wooden table, a brown box tied with a grosgrain ribbon awaited us! I almost didn't want to open it! You have to understand, to someone like me who revels in ribbons and packaging this is heaven! Diving into our boxes, Kara (aka LuluLucky) talked us through the bits and bobs. A cute little clipboard contained all the essential information to get started, a thick pad of paper full of possibilities, all the writing implements and the all important lettering guide. We started by tracing the letter guide with pencil to get comfortable with the letter forms and the flow of the strokes of each letter. Harder than it sounds, it was very different to my normal writing style and was way harder than it looked. We hadn't even gotten to the ink part yet! A welcome break for lunch....such intense concentration makes you hungry you know! A yummy spread was provided and allowed us all to have a chat and discuss our successes and failures for the morning. Fed and hydrated we launched into the ink and nib! Oh my its really hard, not helped by the fact that I thought I was going to be a natural. Kara assured us it can take a while and to just keep practicing until you find your style. Some of the class really were naturals, which did not help my cause. I will say though that sometimes it is the imperfections that make it great. 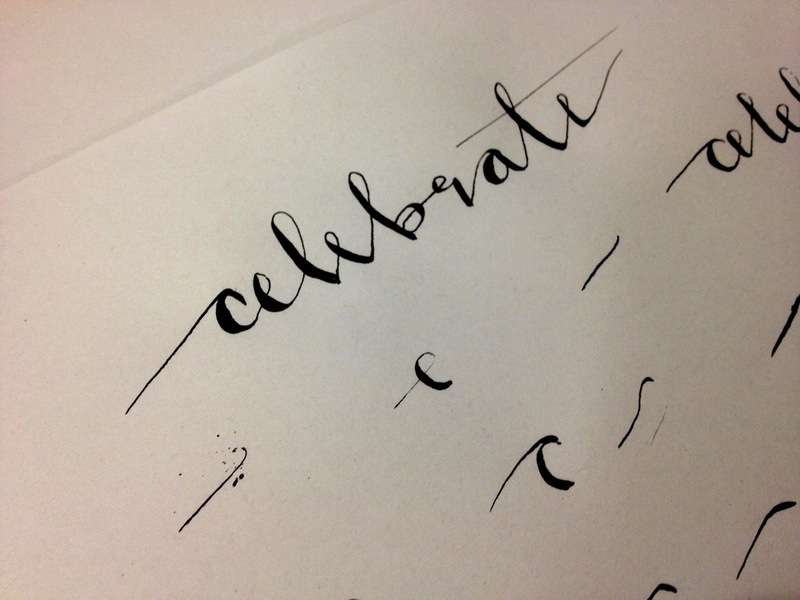 In a world of technology, little ink splatters and wobbly lines gives it that handmade quality. That's what I say anyway. Sadly, the class was drawing to a close and the room was full of the chatter of a room full of people now hooked on the art of modern calligraphy. I want to say thank you to both Kara of Lulu Lucky for being so encouraging and of course to Jaclyn from Blog Society for bringing together a fantastic class! I cannot think of a better way to spend an afternoon. I am practicing like a demon at home and getting slightly better and I think even finding a style of sorts. Well hello all! What can I say it really has been a while, over a year since I posted with any regularity. I have to say I considered saying goodbye to my little corner of the internet, because frankly I was so overwhelmed by all the wonderful blogs and images online, that I questioned why I even bother? Whilst having access to whatever you want online is great ,it can also create a feeling of mediocrity. Anyway, I got over myself and decided to revamp things a little and thought so what I if I write this and only my Mum and friends read it! I enjoy doing it, right? So, from now I want to write about what I like and not what I think people will like. I'm not at the cutting edge of design so don't expect to read about it. It will be just an honest blog of things I stumble upon, Melbourne happenings and other general odds and ends. I have changed to a new site, moved away from blogger and now have my own web address www.littlelettersdesign.com! My blog will be here, but I will start posting more photos in my galleries, news and events and a shop coming soon. What better day to re-launch Little Letters than today my 35th Birthday! Happy Birthday to me and welcome back Little Letters! My childhood was spent exploring the woods surrounding my home, building huts and little hidey holes. So, it comes as no surprise that as a 'grown-up' I am kinda obsessed by woodland cabins and country hideaways. I dream one day that we may have something like this near the Victorian Alps, it's good to dream right? So I have picked a selection of my favorite Pinterest finds....just to help the day dream along! Sustainable cabin on Ragged Island twenty miles from the coast of Maine Alex Scott Porter, who designed the structure for her retired father. It has been some time since I wrote anything on my little tiny corner of the world wide web. I have sat down on a number of occasions to write something but there was always too many other things going on in my head to focus on what seemed to be frivolous in the grand scheme of things. Late last year we lost our wonderful nephew very suddently. He was just 15 years old and it turned my Aussie family upside down. He was a wonderfully vibrant, fun loving young man who really did light up any room he walked into. We miss his laugh and bright smile every day, but we will always have that memory to cheer us up in our sad moments. We love you lots..and your always in our thoughts! It's cliché but it really does make you appreciate the little things in life and how important the people close to you are. Hug them all tightly guys. 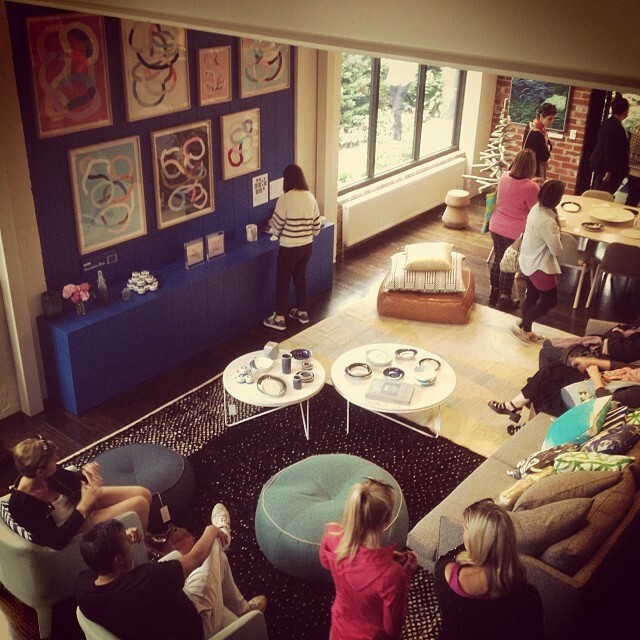 Life Instyle - Doing it for the kids! I don't have any kidlets of my own but I couldn't help but be distracted by the wonderful array of kids products, when I visited Life Instyle trade show in Melbourne last weekend. A little of my fascination was fueled by the kid inside and all the things I know I would have LOVED when I was young. So for those of you who have little cherubs of your own, I thought I would highlight a few great companies that really caught my eye. First up is New Zealand based company Flatout Frankie. As many of you are aware the box is often the highlight for many kids when a new TV is bought or even when it surrounds a new shiny toy! Go figure! The smart peeps at Flatout Frankie have capitalised on the cardboard box fascination of little ones and taken things a step further designing a wonderful range of cardboard flat pack toys. These toys not only encourage creative minds to think 'outside the box', they also are friendly on the environment and aren't gonna cost a small fortune! They really are a blank canvas for some serious fun, I mean come on, who wouldn't want to have some fun with crazy dinosaur heads, cardboard aeroplanes, cars...or even a princess castle! Keep an eye on their website a Flatout Frankie or follow them on Facebook! Next up may be the the most fun thing EVER, a big call I know! I met the Smellie peeps at the show, perhaps I should clarify when I say Smellies, thats not my name for some odorous people I met on the day, it's actually Smellies Clothing a T-Shirt company who have brought back the 80's scratch and smell stickers fad with a new spin. They have in fact created a range of super fun scratch and smell T-Shirts! How fun, yes? I was blown away with how clever it was, it was like something out of a Willie Wonka movie! Scratch the popcorn box and it smells like you are sitting down with some butter popcorn and your fave movie, or the candy cane which smells like Christmas, and who doesn't love the smell of fresh strawberries! Oh yeah and what kid is not gonna have a giggle when they tell their friends they have a smellie T-shirt! The tried and tested microcapsule technology holds the scent and is released when scratched. If that's not enough of a flashback they have also relaunched the hyper colour technology we all know and loved from the same era! They are back for the kids to enjoy all over again. Click here to get your kids Smellie too! I am not sure about you but as a kid I was all about creating! I would sit for hours cutting and colouring in or fashioning an egg carton into a Barbie hat. I loved to be creative and be imaginitive and as a result I still love spending hours cutting, painting and making new things (although not making Barbie hats out of egg boxes so much anymore)! Without getting all "in my day" on you, I think a little of this is lost today and computer games/ipads and all things interactive have taken over. So when I saw the Seedling stand at the show I was taken back to my five year old egg box hat making self. I couldn't get enough of their range, really clever ideas which aim to encourage little minds to get creative and discover cool stuff. They have a wide range of items which are a template for their imaginations to go wild. Just a few of the kits include the fashion designers kit,design your own pirate treasure map,or the best in my opinion design your own superhero cape. I think I know a few adults who would even be into that!! Ha! They also had a great pocket money collection, lots of fun little things which are always a winner for those special pocket money treats. You can buy directly from the website or check out where your nearest stockist is at the Seedling website or follow them on Facebook . Next up is another fab company that caught my eye mainly for their stacked abacus like colourful Playon Crayons which are fantastic for little fingers and stack up nicely out of the way when not in use. I also really liked their world maps, great for an adult study to map where you have been or for the kids to decorate and record their travels or just dare to dream of future adventures. Check them out here for stockist details. I could quite easily write all day about all the wonderful things I saw there for more info you can check out the Life Instyle website to have a look at all the exhibitors from the weekend. Tomorrow I will be back with some more highlights from the show just so that I can prove that I did manage to escape from the kids show for a bit. Little Letters Goes to the Fair! The other week whilst checking instagram for the millionth time that day, I piped up on a post about a meet up in Sydney and how jealous I was. A comment or two later and the wonderful Jaclyn of Little Paper Trees hooked me up with a pass for the fantastic Life Instyle trade show in Melbourne. I was there as 'media' so I have taken the bull by the horns so to speak and put together a series of stories based on the things that I saw and liked at the event. In preparation for my big day at the show I decided to pull together some cards to give to people so that I looked a little more professional. I didn't have time to do anything too fancy but I cranked up my little Adana Press and whipped up a some rather fab business cards, if I do say so myself. I went for a blind deboss/emboss - whatever the technical term is - mainly because I was too lazy and time poor to ink the press. On the other side I printed out my deets on the normal inkjet. 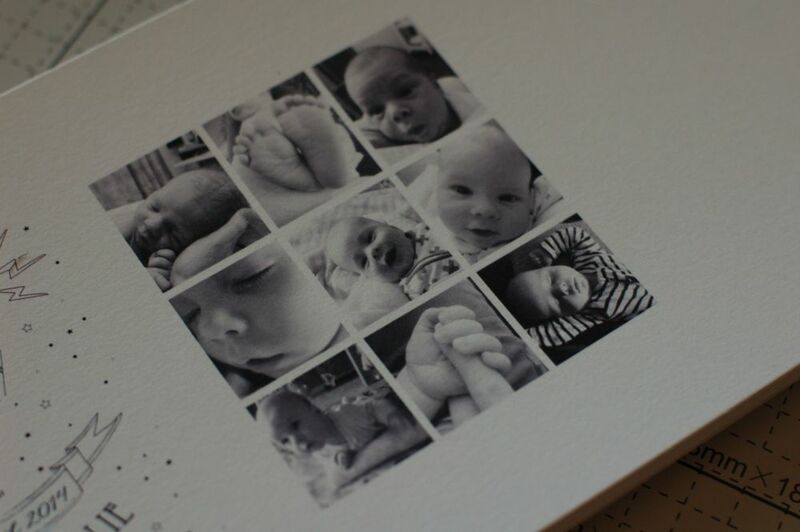 Awesome cards - check, camera - check, comfortable shoes - check! Life Instyle here we go! Over the next few days I will be bringing you a series of posts of some of the wonderful things I saw at the show. First up tomorrow super fun stuff for kids or perhaps the big kids in all of us. Can you resist a nice shop? I know I can’t. This is indeed what you will find when you step into the unique,boutique and antique world of Felix. Positioned in the centre of Dromana on the Mornington Penisula (50km or so from Melbourne’s CBD), it’s a great spot for some retail therapy after a day at the beach. You will find an exciting mix of carefully chosen vintage and modern handmade products, which really do set this store apart from others in the area. If you are rolling your eyes at the term ‘vintage’, which is used oh too often these days for junk that is a few years old. This is not the case at Felix, they really have taken care to “stock only quality, classy, quirky products” and have even given themselves the fun tag of being “boutique recyclers”. Fabulous finds and modern pieces are carefully compiled into colour related ‘zones’ which makes for easy picking if you are looking for something that will match that mustard yellow couch you have at home. I do believe their great eye and thoughtful display, does indeed make for a 'nice' shopping experience in a 'nice shop! I have been having a little bloggers block...! I have been in somewhat of a creative slump lately and I am not too sure why. Perhaps it's the dreary Winter days or maybe the fact that my new job has been tiring and has sapped a lot of my energy recently? Either way I appear to have risen out of this creative rut and feel like I have my blogging mojo back. A few months back I spoke of some changes and new ideas coming and I finally feel like these ideas are a lot closer to fruition now that I am feeling a little more productive. 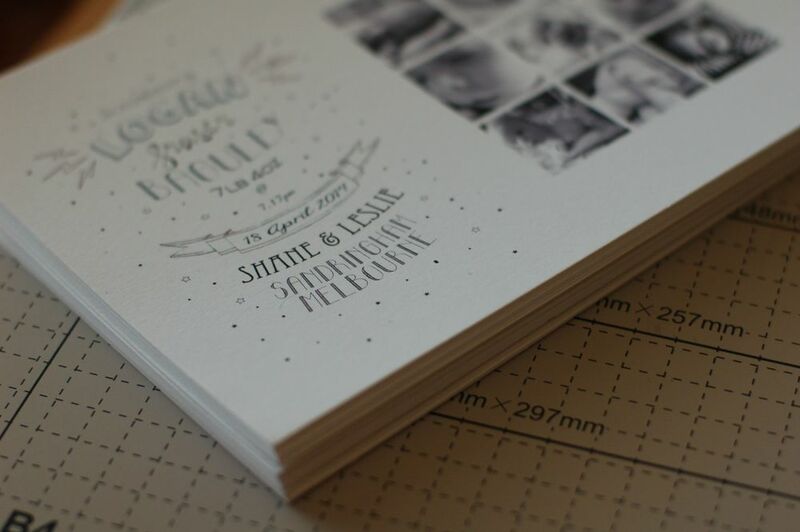 Hopefully you will see something soon using my new Letterpress type! It seems like the rest of the iPhone users of the world I am obsessed by Instagram so I have decided to post up some Instagram sets of the last few months. As I mentioned previously I have been lucky enough to visit New York before, I already have a thousand photos of New York skylines, Statue Of Liberty and the like. You really can never have too many shots of the city sights we all know and love. I couldn't resist a few more which I posted in my previous post - the ones I took when I actually stopped shopping for a moment. I thought for Part 2 I would show some of the less typical things that I saw when I was wandering streets! Perhaps the best (although still touristy) is the new High Line an elevated park, created on the historic freight line high above the streets Manhattan's West Side. I'm thinking this bar/club would be super rad. If the exterior is anything to go by. Now you're in New York! Finally after nearly 2.5yrs of my side by side project with Ross. We were finally Side by Side in NYC! This little photo strip was near the end of a rather large night out drinking cocktails and laughing a lot! Miss ya Jeff! I don't usually post up the joined photo but this is an extra special one for you all to have a laugh at. We thought it was only right to have the same photo - side by side!! Check out our Tumblr home here. Side By Side Week 130 - I need a dollar $$$$! Preppin for NYC! Gots me some $$$$ all ready for some shopping! Yeeha! Whilst settling in for a night on the sofa with a beverage and some crappy TV - the brewing storm hit and a lightning strike took out all the power! Just as well I like candles and have them everywhere! Very useful at times like this! Check out my photo side by side with Ross at our new Tumblr home. Wow so as I already mentioned I am going through a bit of a change in routine, having returned from my trip home (more on that soon) I have launched back into life in Melbourne with a bang. I am half way into week 2 of my new job - the very uncreative world of Pharmaceutical Quality Assurance! As a result of jet lag, new job and general adjustment, Little Letters has gone by the wayside AGAIN!! Thankfully, things are back to normal and I am getting used to my new working hours which in the long run will be giving me more time to spend in my little studio! Exciting changes and fun plans. 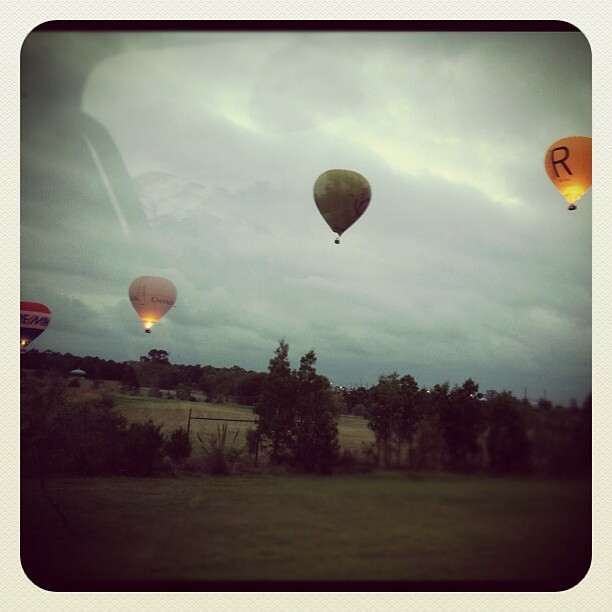 Early morning in Melbourne taken by Shane from his truck! (I'd be in trouble if I didn't give him credit for the photo). Oh my...I have been neglecting my little blog! So what is the reason for this unintended hiatus...! Well in a nut shell quitting old job, interviewing, organising new job and most importantly and most exciting planning and booking a trip back home for a bit of family and friend time. It has been a CRAZY few weeks of paperwork, new visa paperwork and phone calls and general chaos. Now I am back in the swing of things and starting to get things organised for my trip. I am primarily heading back for a wee recharge of Scotland but I am also making a short stop to NYC baby! I have been to New York many times, in fact six times at last count but I think it has been 9 or so years since I last took a bite out of that Big Apple.Aside from obvious shopping, eating and photo taking I am the most excited to see my great friend Ross ( my Side By Side buddy) for a few days. Much like NY it is indeed some time since I last saw him and I can't wait to catch up with him in his Brooklyn hood! I will most likely be spending a rather a long time in airports and on planes. I am thinking this will be a perfect time to write a few posts, and work on some ideas I have had for the blog.